The JCW Acoustic Flooring Cradle System can be used on both timber and concrete subfloors and is suitable for use in both new build and refurbishment projects. The JCW Acoustic Cradle System offers an excellent reduction in impact sound whilst levelling uneven subfloors. 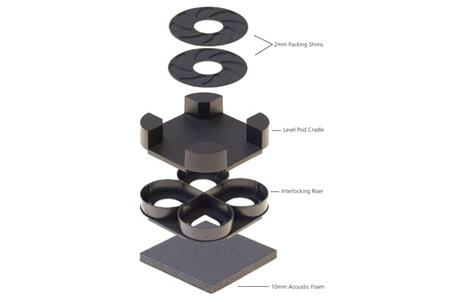 The JCW Acoustic Cradle System can accommodate levels varying from 55mm to in excess of 300mm. A 5mm (min) perimeter edge strip must be installed to isolate the floating floor from walls and skirting boards. It is important that the manufacturers’ recommendations are adhered to for cradle and batten centres. Please contact us for further advice on 01204 387 029. The JCW Acoustic Cradle System has been tested in a UKAS accredited laboratory. When installed correctly The JCW Acoustic Cradle and Batten System will exceed the requirements set out in Part E of the Building Regulations. Our Acoustic Cradles have been used on several large flooring projects including the Holiday Inn at Media City, Park Hill, Sheffield and Psycle, Canary Wharf.